This post was written by Hatchet staff writer Josh Solomon. In a total of 10 minutes and 10 seconds, the women’s basketball team’s game against No. 21 Georgia went from a back-and-forth battle to a rout. Heading into their first matchup at the Georgia State Invite in Atlanta, the Colonials were hoping to play as the same team that upended then-No. 10 Cal earlier in the season, as opposed to the team that was blown out by then-No. 8 Maryland. 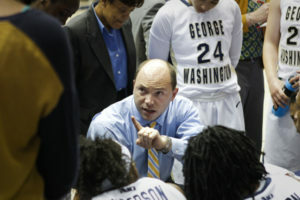 Through the first seven minutes of the game, it seemed that GW was poised for another tight contest with a top-25 team. Bulldogs clung to a 15-13 lead. Less than three minutes later, the Colonials found themselves down 10, courtesy of an 8-0 run. Another Bulldogs run put GW down 18. Junior Chakecia Miller sunk a pair of free throws to end both droughts, but the damage had been done: an 18-4 run to extend a lead that the Colonials could never get within single digits. During the stretch, GW missed seven shots, committed four fouls and turned the ball over six times. At halftime, they were down 40-23. By the end of the game, the Colonials (3-2) found themselves on the losing side of a lopsided 80-60 score. Georgia (7-0) stayed undefeated while GW dropped its second-straight game to a ranked opponent. The Bulldogs’ three-point shooting, along with their second chance opportunities, were ultimately what helped them to take over the game. Georgia would sink eight three pointers on the night, while out-rebounding the Colonials 42-27. Georgia finished with five players in double figures – including a double-double from junior guard Erika Ford, who had 10 points and 11 rebounds, and 19 points from their leading scorer, sophomore guard Tiara Griffin, who came in averaging 14.0 points per game. Meanwhile, all but one GW player to step on the court scored at least four points – but none finished in double figures. Freshman Hannah Schaible scored nine points with six rebounds, three assists and two steals. Schaible was one of the only starters to stay in and lead the second unit throughout the second half. Once again, graduate student Megan Nipe failed to find her shot from outside, scoring just seven points with one three pointer, while going 2-8 from the field. Fellow grad students, Danni Jackson – fresh off breaking 1,000 career points against USC Upstate – recorded eight points and three assists, while Brooke Wilson scored six points and brought down just two rebounds. The Colonials will look to bounce back Sunday as they battle Jacksonville State (2-5), who lost to host-Georgia State (2-5) Friday 65-63.